Happy Star Wars Day everyone! I’m sure many folks are tired of seeing Star Wars-related posts, videos, pictures, sales, and general internet celebrations by now… but I don’t think I’ve ever shared my own formative experience with these films. I’m not old enough to have seen the Original Trilogy in theaters (Episodes IV, V, and VI), but I was one of the young people who went to see the Prequel Trilogy on the big screen (Episodes I, II, and III). Children growing up after the release of the Prequel Trilogy will never experience a time, like I did, when there were only three Star Wars films. I don’t remember exactly how old I was when I first watched Star Wars. Probably seven or eight years old at a guess, maybe even six. I don’t remember my very first viewing or my initial reaction to them. I don’t recall ever hearing or seeing anything about Star Wars before this point. (I was shy, home-schooled, and far more interested in My Little Pony and Grand Champions than with space ships.) 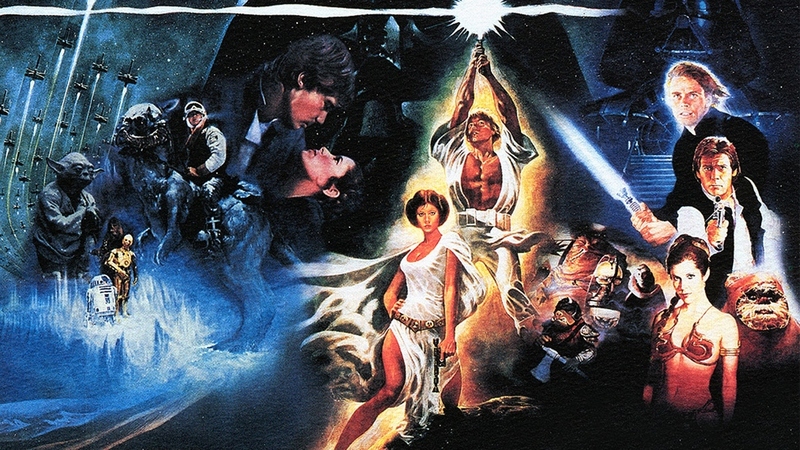 One of the earliest memories I do have is of holding the VHS tape of The Empire Strikes Back, entranced by the cover. I’m not sure if this took place before I actually watched the movies or after; I was fond of sneaking peeks at films and books that were outside my age range. (I used to slink over to the Adult Fiction section of the library like a little wanna-be ninja. It felt so… illicit; I always expected to be caught and booted back to the children’s area by a librarian.) In any case, I must have liked A New Hope, The Empire Strikes Back, and Return of the Jedi, because I watched them again. And again, until I had the entire trilogy memorized. Every line of dialog, every sound effect (even if I couldn’t reproduce them myself), every swell in John Williams’ score, every cut and pan of the camera. I hadn’t even realized how ingrained those elements were in my subconscious until I watched a different edition of the VHS tapes and realized that they “just didn’t seem right.” (The 1980s full screen edition pans differently than the 1970s versions I grew up on. ** You can imagine my horrified reaction when I saw the “special edition” Star Wars DVDs.) Even the advertisements at the beginning of the tapes became part of the experience. I never fast-forwarded through them. Eventually, I’d watched the films so many times that I started watching them in reverse chronological order: VI to IV. Then I started watching them in order of favorite to least favorite: VI, IV, then V. I think I liked The Empire Strikes Back the least because of the second half of the film. The first half with the ice-planet Hoth and the chase through the asteroid field were amazing, but for a seven-year-old, the film got bogged down on Dagobah and Cloud City. It didn’t hold my attention as well due to all the dialog, and I remember being annoyed with Luke for ignoring Yoda’s warnings and going to Cloud City anyway. I couldn’t understand why he would do that, being the last Jedi who could turn the tide in the war against the Empire. The fight between Luke and Vader in the bowels of the city frightened and disturbed me, but I think Luke getting his hand cut off cemented my decade-long dislike of The Empire Strikes Back. I’d never seen a character maimed before; I covered my eyes at that point in the movie for years afterward. Luke’s despairing, pain-filled cry at Vader’s revelation, despite being mocked now all over the internet, I recall as being one of the most heart-wrenching moments on film. As you may have already suspected, I was, and remain, very viscerally attached to these films. To this day, my lip curls in a snarl of disgust and anger when I see Emperor Palpatine on screen, shiver in fear at the ominous Imperial theme, and almost dance for joy at the sight of an X-Wing in flight. I watched and rewatched them to embed the stories and characters into my psyche. My first crush, if you could call it that, was on Luke Skywalker. Star Wars also sparked my earliest attempts at fan fiction; I inserted myself into the narrative. However, in those stories, I portrayed myself as a snarky, confidant, quasi-magical semi-immortal who taunted the Emperor and Vader at every opportunity. The Jedi fascinated me and the Sith repelled me. As I grew older and my reading abilities improved, I discovered the Expanded Universe, and started devouring Star Wars novels. My author self-insertion started to mature from a cocky and carefree adventurer into something darker, more powerful, more isolated, and more dramatic. I started sympathizing with Vader and wondering about his origins, although my hatred for the Emperor remained undiminished. However, I stayed more interested in the future of Star Wars, where the characters I already knew and loved were going rather than what happened in the past. And then The Phantom Menace was announced. I cannot express how excited I was at this news. I was old enough now to understand and appreciate story-telling and film-making in a more meaningful way. Well, as much as a precocious 11-year-old can. And, with the improved technology of the time, I was certain it would be amazing. I freely admit that I enjoyed Episode I a great deal. I didn’t pick up on a lot of the plot holes until much later, nor did I find Jar Jar Binks or the Gungans nearly as irritating as many other people did. The film wasn’t as strong or good as it could have been, but the spectacle and emotional rewards were enough to smooth it over. It had been almost 30 years since George Lucas worked on a Star Wars film; I was willing to cut him some slack. I began working on a fan fiction project to chronicle my adventures through the Star Wars universe from The Phantom Menace through Return of the Jedi, and perhaps even beyond into the Expanded Universe. This is the first time I actually wrote down fan fiction rather than playing out the stories with toys or talking through it to myself. (I wouldn’t find out that this was fan fiction for almost a decade.) So I was, in a word, hopeful. Attack of the Clones shattered that hope. I honestly think two things caused Episode II to receive my enmity: the poorly executed love story between Padme and Anakin and the fact that the clones (which looked like prototype stormtroopers) were in the service of the Republic rather than an enemy. My lack of interest in romance combined with my black-and-white view of the world made it almost impossible for me to accept this as part of the Star Wars canon. Carried along by waves of similarly outraged fans, I spouted vitriol to anyone who would listen. Like many others, in my mind George Lucas went from a visionary god to an overbearing fraud and CGI-obsessed demon. My dad and I spent hours rewriting Attack of the Clones, and The Phantom Menace to some extent, so it would fit our vision of what should have happened. This anger and cynicism remained and colored my viewing of Revenge of the Sith. In my eyes, Star Wars could not recover from the debacle of Episode II. The definition of a bigot is “a person who is intolerant toward those holding different opinions.” That’s exactly what I was when it came to Star Wars. It’s taken a long time for me to acknowledge this. In fact, I think this is the first time I’ve actually said it. As I’ve matured as a person and a writer, I’ve seen the darker, uglier side of fandom and the dangers of espousing elitism and purity. This, I hope, has mellowed my views. I doubt that I will ever really like Attack of the Clones or Revenge of the Sith. I still believe they are flawed movies that suffer from a lack of focus and over-reliance on CGI spectacle. I still dislike what I consider sloppy story-telling and missed opportunities to develop character. I still bristle a little when I hear people, especially children, say they love the Prequel Trilogy and the media that spun off from it. My disappointment with the Prequel Trilogy has left me unwilling to get excited about the release of Episode VII this December. But I confess that I had a rather childish over-reaction to being disappointed by movies I’ve only watched once. Hopefully I’ve grown up a little, maybe enough to acknowledge what the Prequel Trilogy did well rather than only talking about what they did… differently. I can’t even say “wrong” anymore, because it’s just my opinion. Who am I to say what is wrong or right about the direction a story takes? There’s plenty of evidence to argue both ways. I might disagree with the creative choices, but does that make it “wrong”? If there’s one thing I’ve learned about writing, it’s that a story can go in so many directions. Some work better than others, but that doesn’t make them “wrong.” Just different. Really, I should be grateful. The Prequel Trilogy has entranced a whole new generation. Something about them struck a chord with that generation, just as the Original Trilogy struck one for me. If Star Wars captures their imagination, I shouldn’t quibble about which Trilogy they enjoyed more. (Of course, I still think the Original Trilogy is better.) Even though there are television shows, books, and comics that spin off from the Prequel Trilogy, stories relating to the Original Trilogy are still being made. I shouldn’t be surprised; an entire galaxy and a chronological span of at least 20,000 years is a big sandbox. Star Wars remains very much alive in the public consciousness, a cultural phenomenon. As happy as I am that Star Wars is accessible to so many people, sometimes that makes me sad. These days, it’s almost impossible for anyone to experience the Original Trilogy, or even the Prequel Trilogy, without knowing the big reveals or powerful moments that entranced me. So much has been referenced, overused, and parodied. Two people I know have never seen Star Wars but are still familiar with the story and characters, just through cultural osmosis. It makes me wonder if the story will ring as true or as deeply as it did in the days before the internet and prevalence of nerd culture. I still want to share it, but it won’t be the same. It never is, from film to film, viewing to viewing, person to person. **Editor’s Note: I’m afraid I listed the wrong dates. The versions I watched as a kid are the 1990 releases from CBS/Fox Video. The version that pans differently is the 1995 Fox Video/Lucasfilm release. This mistake has been left unchanged in the text due to the amount of work it would take to fix and re-upload the Audio Edition. My apologies! Previous Post Back from (Re)Generation Who!